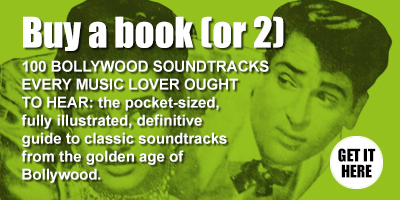 To the extent Shankar Jaikishan's 'Ek Phool Char Kante' is well known it will likely be for featuring actor/singer/Elvis-soundalike Iqbal Singh's 'Bombshel Baby' [sic], a track that would lend its title to Bombay Connection's superb compilation 'Bombshell Baby of Bombay' in 2006. What's interesting, apart from it being an ace early rock 'n' roll number with a wonderful swing to it, is that the words were changed from slightly suggestive 'Bombshell Baby of Bombay' on the record to the rather more pedestrian 'Beautiful Baby of Broadway' in the film. Why isn't quite clear; the aforementioned compilation's liner notes suggest "Perhaps the Indian censor board was wary of the explosive potential of the lyrics...". Similarly styled (and almost as fab) 'O Meri Baby Doll' was however deemed appropriate. The other two tracks are nice too, especially Lata's lovely 'Banwari Re'. 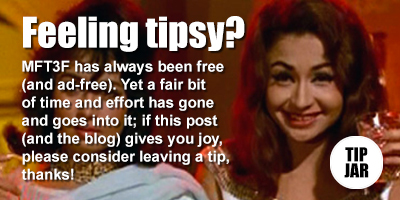 There's more of the same to be found on Iqbal Qureshi's 'Love In Simla' [review]. Part rock'n'roll, part Latin ballroom, the lively 'Gaal Gulabi Kiske' wouldn't have sounded out of place on a Shankar Jaikishan score, and 'Dil Thaam Chale' proves how effective the sound of a train engine works as rhythmic backing, here with the added effect of getting stuck in my head for a few hours after every time I hear it. Both are great songs. Two EPs of songs from this film were made (no LP was released at the time), unfortunately I don't have the other one. whoa, almost missed you were back. thank you! much appreciated.